Signup for our store newsletter. TO SEE THIS 360° VIDEO ON YouTube. 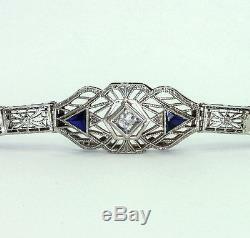 This is a beautiful antique diamond, sapphire and 14K white gold bracelet measuring 7 1/8 inches long and 1/2 inch (12.4 MM) at the widest point. 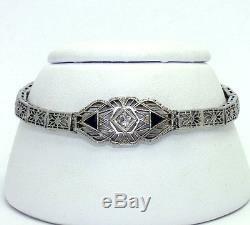 The bracelet is prong set with a natural, genuine, untreated, center, round. 10CT European cut diamond measuring 3.2 MM to 3 MM by 1.8 MM deep of J color and SI2 clarity. 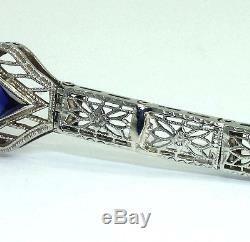 It complements two (2) bezel set, deep blue triangular sapphiress measuring 4.3 MM by 3.7 MM by 2 MM deep totaling. That makes the total in all genuine gems with no chips or cracks. The bracelet features crisp and distinct millgrain edge and filigree details and is nicely made with a gallery for structure and finished look. It has a secure box lock with a hidden safety and is marked, tested and guaranteed 14K. Two links from the center station have previously been professionally repaired and are soldered together. 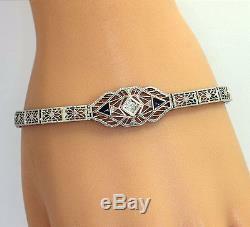 This does not affect the beauty or wear-ability of the bracelet and is mentioned for accuracy. 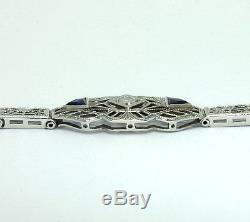 The bracelet has been professionally cleaned and brightly polished and weighs 7.7 grams. It might also make a great gift for that someone special with a September birthday as that month's birthstone is the sapphire. Empire Jewelers has been business for more than 25 years, and specializes in fine jewelry, diamonds, gold, sterling silver, estate and vintage jewelry, coins and other precious metals. We are certified, licensed and bonded, and bank references are available. We encourage you to request our references, ask us questions and read through our customer feedback. Empire Jewelers is the largest wholesaler of jewelry from store close-outs, manufacturers buyouts and estates in Long Island, New York. We dont claim to have everything. But, what we do offer is of the highest standards of quality, at unbeatable, true wholesale prices. 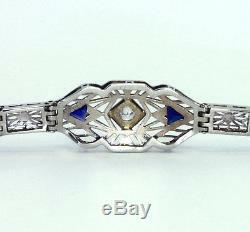 The item "Antique diamond sapphire bracelet 14K white gold filigree Euro cut trillion. 50C" is in sale since Thursday, November 16, 2017. 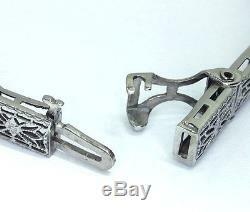 This item is in the category "Jewelry & Watches\Vintage & Antique Jewelry\Fine\Unknown Period\Bracelets".